Martin Luther, Das Allte Testament deutsch. – Das Ander teyl ... – Das Dritte teyl des allten Testaments. c. 292 x 197 mm. With 11, 23, and 1 woodcuts by Lucas Cranach the elder and his workshop. 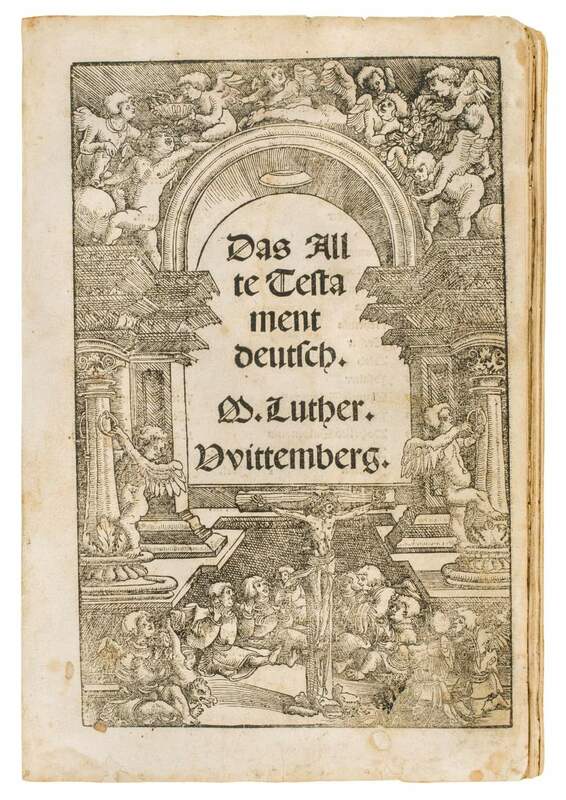 Old Testament – First editions of the first three parts of Luther’s translation. Martin Luther, Das Allte Testament deutsch. – Das Ander teyl ... – Das Dritte teyl des allten Testaments. Illustration by Lucas Cranach the Elder and his workshop. 292 x 197 mm. – I. ff. , CXXXX, . II. ff. . CCXVI [=217]. III. ff. , IC. With 11, 23, and 1 woodcuts. As soon as the New Testament was complete, Luther began translating the Old Testament, which was published successively in parts. However, the translation took many years, and Luther’s first complete Bible did not appear until 1534. The present first three parts of Luther’s translation comprise the Pentateuch, the historical books (Joshua – Esther) and the poetical books (Job, Psalms, Proverbs, Ecclesiastes, and Song of Songs). As with the New Testament edition of 1522, Lucas Cranach the Elder (1472-1553) and his workshop also provided the illustration for these first parts of the Old Testament. From the very beginning of Luther’s Reformation, Lucas Cranach created pictures to promote the new theological concept. These first parts of the Old Testament are extremely rare. We can trace no copy in commerce comprising all three parts together.